The staff of the Downtown Orlando Post Office, located at 44 East Central Boulevard in Downtown Orlando, Florida, in 1938, including Postmaster Beggs. All employees of the Post Office, including the custodians, were considered full employees of the federal government making these jobs quite sought after by the general public. Employees were well taken care of thanks to government benefits and job security was rather high making these jobs secure and reliable sources of income. In 1935, when James Beggs, Jr. became the postmaster, he began petitioning to move the post office from its Central Boulevard and Court Avenue location to a more spacious building. In 1939, St. James Catholic Church sold a plot of land on Jefferson Street for the new building. The building's designer was Louis Simon, who used a Northern Italian Palazzo Revival-style. The new building opened in 1941 and housed the post office, the courthouse, and Internal Revenue Service (IRS) offices. Original black and white photograph, 1938: Orlando Remembered Exhibit, Downtown Orlando Post Office, Downtown Orlando, Florida. Digital reproduction of original black and white photograph, 1938. Diver Studio. 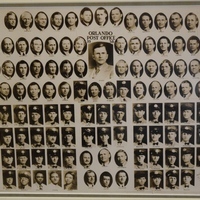 “Personnel at the Downtown Orlando Post Office, 1938.” RICHES of Central Florida accessed April 23, 2019, https://richesmi.cah.ucf.edu/omeka/items/show/5605.